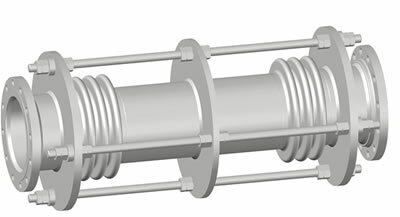 Types of expansion joints | What are expansion joints? | Greetings,Company outline,Company history,Access | Nippon Metal Hose, a manufacturer and seller of flexible metal hoses, expansion joints, and chemical hoses. 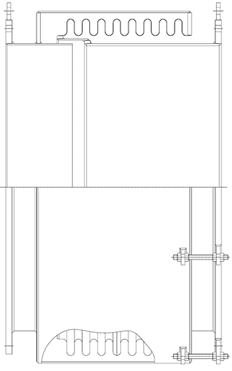 ・The basic type of expansion joint. 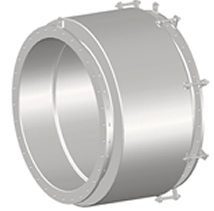 For this type, thrust generated by internal pressure is applied to the fixed points. 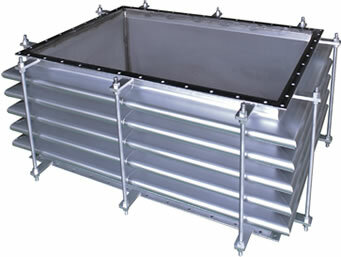 ・If high internal pressure is applied, a reinforcement ring is used to prevent deformation of the bellows. Three types of shapes are available. ・A duplex type can used if displacement in the direction perpendicular to the axis is large. 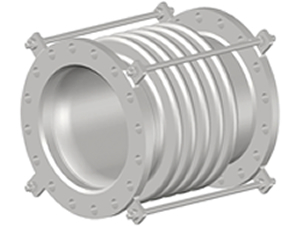 ・If high internal pressure is applied, a reinforcement ring can be used to prevent deformation of the bellows. ・This type is characterized by the structure where internal pressure of the fluid is applied in the area between the inner surface of the external cylinder and the outer circumference of the bellows. ・There is no risk of buckling of the bellows even at high pressure. ・A drain on the external cylinder makes it possible to easily remove accumulated liquid. ・This type can absorb angular displacement on a plane. ・It is designed to restrain the thrust generated by internal pressure by a hinge pin, thus applying no thrust at fixed points. 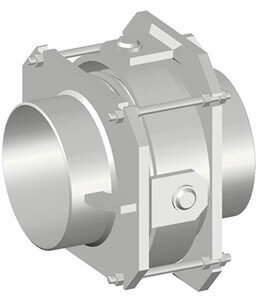 ・By combining two to four items on a plane, this product can absorb displacement in the axial direction. ・As the number of items combined is increased, the product can absorb greater displacement. ・Moreover, by combining a gimbal type with this type, it becomes possible to absorb displacement not only in the axial direction but also in the direction perpendicular to the axis in all directions. ・This type can absorb angular displacement in all directions. ・It is designed to restrain the thrust generated by internal pressure using a gimbal pin, thus applying no thrust at fixed points. 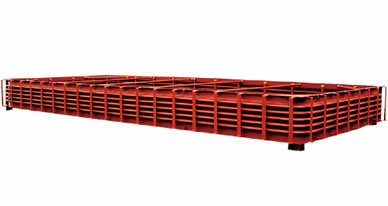 ・This product is the application of the basic duplex type and is equipped with extension bolts that restrain extension in the axial direction. This eliminates thrust applied at fixed points. 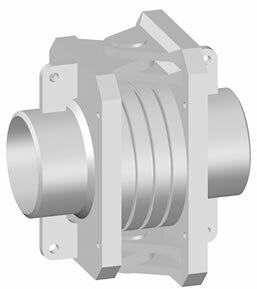 ・This product adopts a structure where the bellows tip is folded back in the shape of a collar to attach the bellows to the flange without welding. For this reason, all wetted parts are made of stainless steel. 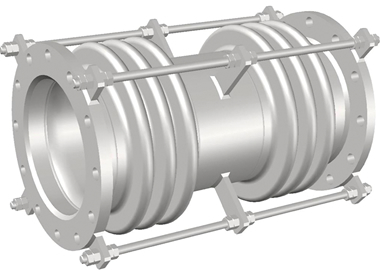 ・A balance bellows is inserted and connected between two displacement bellows to offset the thrust generated by internal pressure in the expansion joint. This eliminates the thrust applied at fixed points. 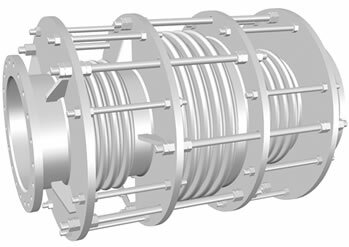 ・The outer diameter of the balance bellows is required to be about 1.4 times that of the displacement bellows, which makes the maximum outer diameter of the entire expansion joint larger. ・Absorption of displacement in the direction perpendicular to the axis is also enabled by adopting a duplex-type displacement bellows. 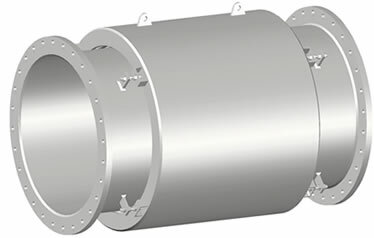 ・By connecting a displacement bellows placed at the elbow of the curved pipe and a balance bellows placed behind the elbow, the static thrust generated by internal pressure is offset in the expansion joint. This eliminates the static thrust applied at fixed points. ・The balance bellow sticks out from the piping system. 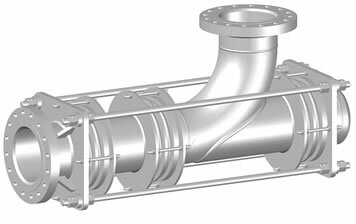 ・With the cross section especially designed for use with square ducts, this product is suited for a large volume of gas flow at low pressure. ・A duplex type can be used if displacement in the direction perpendicular to the axis is large. ・The thrust generated by internal pressure is applied at fixed points. ・Three types of shapes are available for the corner part. 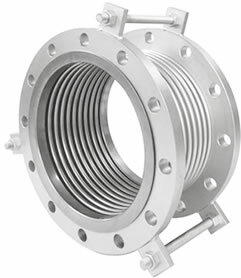 ・This type is used for flue ducts and supports large diameter exceeding 10 m.
・A duplex type combining two units of this type and an intermediate duct can be used if displacement in the direction perpendicular to the axis is large. ・A heat-retention fitting is attached on the circumference.